The recent Steve Jobs biography by Walter Isaacson is, I found, un-put-downable and compelling: a sweeping, stimulating, poignant narrative of one of the most fascinating persons of our era. Jobs is not an exact contemporary, being about 12 years older than I am, but he is near enough to make the book that much more connected to my own experience. I found the book vastly more fascinating when its narrative timeline intersected with my own personal experiences with Jobs’s products: experimenting with an Apple II in the early ‘80s, excitedly acquiring my own Macintosh in 1984, thrilling to my iPhone in 2008. 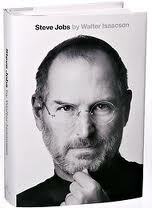 Isaacson doesn’t hold back on the negatives: this is not a hagiography. As fascinating as the book is, it does not lead you to like Jobs as a person, and it leads you only to a very qualified degree of admiration for him as a leader, even as you are (or I was) astounded by his accomplishment. The nasty edge of his personality was not necessary. It hindered him more than it helped him. But it did, at times, serve a purpose. Polite and velvety leaders, who take care to avoid bruising others, are generally not as effective at forcing change. Dozens of the colleagues whom Jobs most abused ended their litany of horror stories by saying that he got them to do things they never dreamed possible. I think of some of the cooking competition TV shows I like so much, such as Next Food Network Star and Top Chef, and one of the things I appreciate most about these shows is the skillfulness by which they give strong, direct, frank, honest, cutting, criticism, and, even more, the way most contestants take that criticism and use it to make themselves stronger. How I aspire to grow in this way. There is no way to excuse Jobs’ intemperance, his obnoxious, petulant, horrifying belittlement and withering dismissal, but that is not to say there is no value to derive or nothing to learn from observing this aspect of his management style. This intensity encouraged a binary view of the world. Colleagues referred to it as the hero/s…head dichotomy. You were either one or the other, sometimes on the same day. The same was true of products, ideas, even food: Something was either ‘the best thing ever’ or it was sh…y, brain-dead, inedible. For me and in my efforts to lead and innovate, the world is a set of shaded greys, not ever black and white, and the work of innovation is that of trial and error, sorting our way through to what works better and where we can find breakthroughs that make a difference. Mine is more is the “Google-Beta” model, and it is a far cry from Jobsian perfection, of instantaneous and conclusive judgment and perfectionism. But as Isaacson explains it, this either/or worldview was a byproduct, not a necessary or inevitable byproduct to be sure, of something enormously admirable: Jobs’ phenomenal focus and relentless passion. He cared so deeply, and believed so strongly that we can make things which are excellent and we must “make a dent in the world” that, in his way of pursuing his passion and making a difference, this intensity was the result. Would that we all cared as much as Jobs. Buying an iPad for your kids isn’t a means of jump-starting the realization that the world is yours to take apart and reassemble; it’s a way of telling your offspring that even changing the batteries is something you have to leave to the professionals. In a world filled with junky devices, inscrutable error messages, and annoying interfaces, Apple’s approach led to astonishing products marked by beguiling user experiences. Using an Apple product could be as sublime as walking in one of the Zen gardens of Kyoto that Jobs loved, and neither experience was created by worshipping at the altar of openness or by letting a thousand flowers bloom. Sometimes it’s nice to be in the hands of a control freak. Jobs’ intensity was also evident in his ability to focus. He would set priorities, and his laser attention on them, and filter out distractions… He got Apple back on track by cutting all except a few core products. He made devices simpler by eliminating features, and interfaces simpler by eliminating options. He didn’t invent many things outright, but he was a master at putting together ideas, art, and technology in ways that invented the future… Some leaders push innovations by being good at the big picture. Others do so by mastering details. Jobs did both, relentlessly. Was he smart? No, not exceptionally. Instead he was a genius. His imaginative leaps were instinctive, unexpected, at times magical… Like a pathfinder, he could absorb information, sniff the winds, and sense what lay ahead. More than anyone else, he made products that were completely innovative, combining the power of poetry and processors… He built a company… that thrives best at the intersection of artistry and technology. Isaacson allows us also to hear from Jobs first-hand as he articulates his ideals and values regarding innovative leadership. There is a strong temptation in our networked age to think that ideas can be developed by email and iChat. That’s crazy. Creativity comes from spontaneous meetings, from random discussions. You run into someone, you ask what they are doing, you say ‘Wow,’ and soon you are cooking up all sorts of ideas. If a building doesn’t encourage that, you’ll lose a lot of innovation. So we designed a building to make people get out of their office and mingle in the central atrium. You would think that the CEO of Disney would be curious how Pixar was [being so successful.] But during that 20 year relationship, he visited Pixar for a total of two and a half hours, only to give little congratulatory speeches. He was never curious. I was amazed. Curiosity is very important. Our job is to figure out what they’re going to want before they do. People don’t know what they want until you show it to them. That’s why I never rely on market research. Our task is to read things that are not yet on the page. There’s something magical about [that intersection of the humanities and science.] There’s a deep current of humanity in our innovation. You always have to keep pushing to innovate. The Beatles were the same way. They kept evolving, moving, refining, their art. That’s what I’ve always tried to do– keep moving. What drove me? I think most creative people want to express appreciation for being able to take advantage of the work that’s been done by others before us. Everything I do depends on other members of our species and the shoulders we stand on. And a lot of us want to contribute something back to our species and add something to the flow. We try to use the talents we do have to express our deep feelings, to show our appreciation of all the contributions that came before us, and to add something to the flow. That’s what has driven me. Of enormous interest throughout the Isaacson Jobs is the relationship between Jobs and Gates: their rivalry, animosity, and yet, almost bizarrely, their friendship and collaboration. Among the most poignant moments comes very late in the book when Gates comes to the Jobs home near the very end, and they discussed, among other things, education. Jobs asked some questions about education, and Gates sketched out his vision of what schools in the future would be like, with students watching lectures and video lessons on their own while using the class-room time for discussions and problem-solving. They agreed that computers had, so far, made surprisingly little impact on schools– far less on other realms of society such as media and medicine and law. Perhaps among the many ways we have to honor the Jobs legacy, and, to quote him, “show our appreciation of all the contributions that came before us, and to add something to the flow,” is to carry his work forward in developing “schools in the future” by educational leadership and innovation: innovative leadership marked by Jobsian passion, relentless focus, intensity, honesty and directness, curiosity, concern with providing an excellence of user (student) experience, and integration of the humanities and sciences. Let’s make a dent in the world. Did you see Jonathan Ives speak at Apple’s celebration of Steve Jobs’ life? -very interesting to watch after reading the book. Great post! I loved the book too and was struck by the similarities between Isaacson’s other subjects to Jobs in terms of personal life and the difficulties a genius might have in forming relationships. Although not a pleasant side of him, I think he was a master at perceiving the best in a product or in a person and pouncing on it while quickly dismissing anything that did not fall into his awesome category. Your post highlighted some great points about Jobs. Education should take some of these ideas and use them as an inspiration for improvement and reform. Nice piece, Jonathan. I struggle a little with this though. If “our job is to figure out what they want before they do” (Jobs) then why would we want a device whose ecosystem tells “your offspring that even changing the batteries is something you have to leave to the professionals.” (Doctorow). I am often challenged for my embrace of the messiness of process at the expense of clean outcomes. I relish the messiness of learning and sometimes find Apple too sanitary. Funny thing is, Jobs embraced the messiness as well. His leadership, vision and learning was deeply embedded in the messy process of learning and then cleaned and polished and sold to us with smooth lines and gleaming graphics. Don’t change it though! If you mess with it, it isn’t right. I loved watching my students “blow-up” their Lunix laptops, make them do what they wanted them to do and then do it all over again. I guess I’d like to think we used open source and Linux to make more Steve Jobs’ and less of Steve Jobs’ customers. Thanks to the five of you for your great comments. Alex, I love your line, and of course I agree: Let’s work to help our students become more Steve Jobses and fewer customers. This tension runs through the book and through our reading of it: we want innovators who have the compelling power to make intuitive devices easy to use and empowering for a wide range of users– Steve Jobs did this, but at the cost of user adaptation and innovation within the device. Great stuff for consideration– thanks Alex.